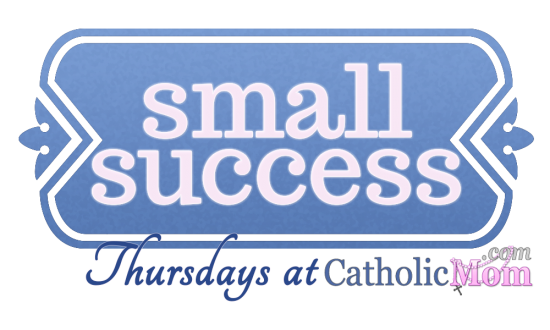 It’s time for Small Success Thursday over at CatholicMom.com. This was a powerful experience for me but a weird one, so if you’re weird enough to read my blog, you might get something out of reading the following. My brother-in-law lost his life to lung cancer last Tuesday, the Feast of St. Jude. This is one of those cases where, since my husband is a Tiber-crosser, his family isn’t Catholic, so the comfort of the sacraments wasn’t something on their minds. It was on mine, though. Family is tricky, especially in-laws, especially when they live far away and we’re not all that close to begin with. As my BIL was suffering his own lung problems, coincidentally I was in the depth of my annual viral-triggered asthma cold. For those of you unfamiliar, this means sleepless, wheeze-filled nights and wheeze-filled, cough-filled days. So, given the constraints of earthly relationships and distance, I told God I’d take the wheezing and coughing and offer it up to help my BIL in his suffering. I didn’t do a formal novena, but I asked St.Jude to plead God’s mercy for my BIL as well, and I asked that if BIL passed on St. Jude’s feast, it would be a sign of that mercy. So that happened. That’s not all. The service for BIL was on the evening of All Saints. That night, I was fighting the wheezing and coughing so I could get to sleep. In that twilight between too tired to be fully awake and too wheezy to actually be asleep, I had a sort of waking dream (not a vision or hallucination, mind-you). In it, BIL sat on the side of the bed and palpably touched me on my left bicep. Within moments my wheezing stopped and I fell asleep. Now, I’m no theologian, nor can I say with any certainty what God judges for either of us. Still, the possibility that my offerings for my BIL meant something to him and he knows that I cared enough to offer him my suffering… as Small Successes go, it’s not like it’s a success I can claim, but it is a success for our relationships with each other in Christ. We may be bound by the sacraments, but I’m grateful that God is not. The laundry is being done and there were a few days in the past two weeks where we didn’t spend a red cent on takeout of any kind. Driving up and down the state from the height of fall color into its decline inspired a poem. I don’t do poems often, but I do like them. So I wield the axe. The tree suffers no more. This is so cool! I’m glad you were comforted about your brother-in-law (and I hope you know that I”m very sorry for your family’s loss, even if I started with “cool!”). I’m always grateful for consolations God sends in times of great sadness or distress. It’s like a little gift: unwarrented, undeserved, but loved and appreciated. Thanks so much for visiting. It is pretty cool when God can console us in such obvious ways. We can’t presume, but we can be confident and thankful! Neat story. I do think it’s totally possible for God to allow these special glimpses into heaven. So cool. Thank you for your kind words! And do stop by again some time! Don’t you DARE leave comments on my blog that you are a slacker. I know what these past couple of weeks have held for you. And your BIL story: COOL!!!!!! What a blessing and comfort that must have been for you. What a cool story. I know God gives us glimpses of His mercy, even though they aren’t Church-approved apparitions or whatever. 🙂 I am a convert, so the whole offering up my suffering for others is something that doesn’t automatically pop into my tired brain. Thank you for the reminder. I hope your asthma is under control again, and your poem is beautiful. Have a great week! Your first story brought tears to my eyes. There’s a short story in there. Are you writing it or am I?